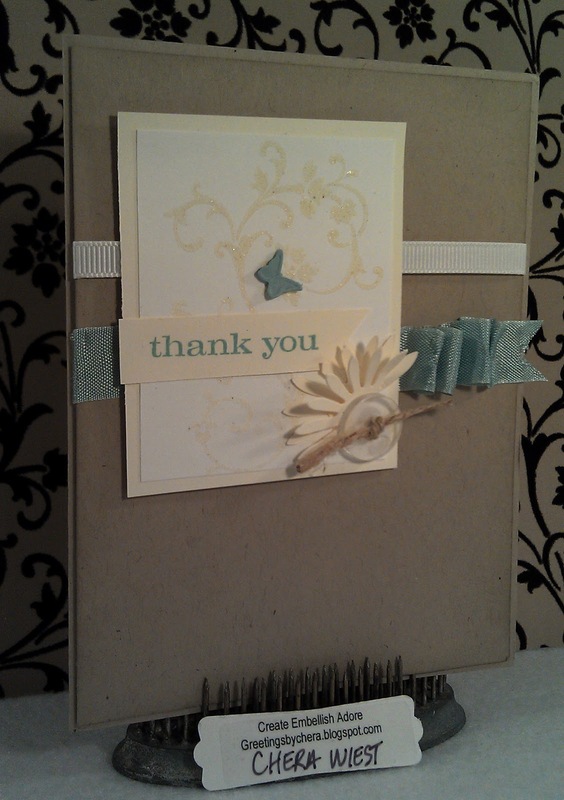 It amazes me that people have lost the abillity to send Thank you cards when appropriate. I 'get' we are in an electronic world. I also 'get' that this GenY, or whatever it is, has a higher "entitlement" then ever before. Trust me, I am in Human Resources... we see it all the time.. but a simple THANK YOU, is like rude manners... truly! Ok, I am off my box. 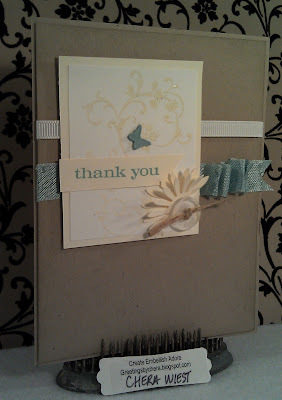 Imagine my surprise when asked by a college gal, who was seeking thank you cards... they were to be simple and clean. I made a box of Thank you cards like this - she is going to send them to businesses that assisted her during her college days. I used different colors, so she had variety to choose from. Personally, I liked the Baja Breeze the best! I embossed the Elements of Style on Whisper White embossed with Vanilla powder. The Whisper White is layered on Vanilla. I used the 1/4 Grosgrain Whisper White ribbon and Baja Breeze Seam Binding Ribbon. The flower is the smallest from the Daisies #2 Big Shot die. hats off to the gal wanting the cards; thank you for sharing this, as it's a wonderful layout!